Pamper yourself and look flawless in a flash with FREE Touch Up in Central Department Store Indonesia! In Beauty Galerie, Ground Fl. 1. 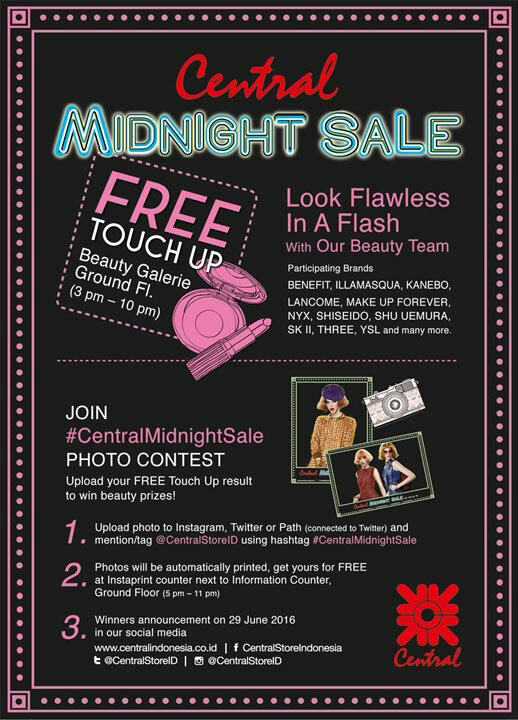 Upload photo to Instagram, Twitter, or Path (connected to Twitter) and mention / tag @centralstoreid using hashtag #CentralMidnightSale. 3. Winners will be announced on 29 June 2016 in our social media. *Winners will be selected by best picture by Central Department Store Indonesia internal committee. The decision is absolute and inviolable.